WASHINGTON – A top women’s rights group is hailing the Sept. 7 executive order by President Obama extending up to a week of paid sick leave to some 300,000 workers who toil for federal contractors. But while the National Partnership for Women and Families praised Obama’s ruling, Congress’ ruling Republicans screamed. They pushed their own alternative: Comp time for overtime, at the employer’s discretion, instead – though they didn’t add that caveat. Obama announced the executive order in a speech after a Labor Day breakfast with union leaders in Boston. It will take effect in January 2017, just before he leaves office. And, unlike a law, his successor could revoke the executive order. Federal law gives workers, if their firms employ at least 50 people, up to six months of unpaid sick or family leave, with a supposed guarantee they get their jobs back afterwards. But so many workers are either not covered or can’t afford six months without pay that millions of workers don’t use the unpaid leave to care for themselves, their children or their elders. NPWF Executive Director Debra Ness called Obama’s order “terrific,” but only a first step. She again urged Congress to pass a paid sick and family leave law. Some 40 percent of eligible workers cannot take even the unpaid leave, she pointed out. Obama’s order “will mean 300,000 workers who service federal contracts but cannot earn paid sick days now will soon be able to earn the paid sick time they need to recover from common illness, seek preventive care, or care for sick children or other relatives,” Ness said. 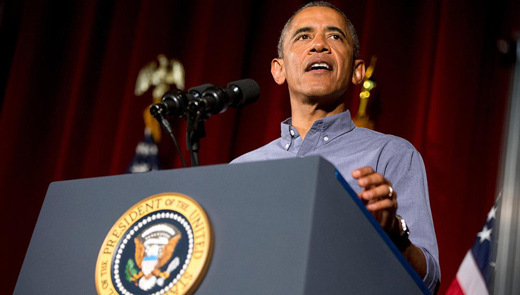 Earlier this year, another Obama order extended paid leave to regular federal workers. “Others in the federal contracting workforce will have access to a greater amount of paid sick time than they do now,” Ness said. “This has the potential to help reduce the appalling number – more than 43 million, according to recent data from the Bureau of Labor Statistics – of workers who cannot earn a single paid sick day, no matter how long they hold their jobs. She also lauded Obama for again advocating the paid sick and family leave law, which organized labor, women’s groups and congressional Democrats all support. “We are the only advanced country on Earth that doesn’t guarantee paid sick leave or paid maternity leave to our workers. And that forces too many parents to make the gut-wrenching choice between a paycheck and a sick kid at home,” Obama said in his State of the Union address earlier this year. But the paid leave law, crafted by Rep. Rosa DeLauro, D-Conn., with NPWF aid, has gone nowhere in the GOP-run 114th Congress. House Education and the Workforce Committee Chairman John Kline, R-Minn., and Rep. Denny Walberg, R-Mich., summed up the GOP attitude in their negative response. They accused Obama of catering to “union bosses” and said their legislation would let workers “accrue paid time off to use as they see fit,” without mentioning that their measure leaves it up to the boss about whether – and when – the worker would get comp time or overtime pay.